The heading says it all. That's what we felt throughout the EpikGo hoverboard test, fantastic. It can take you across any terrain and at a speed of 12.1 mph we blazed by the regular hoverboards with ease. It'll take you up towards 12 miles on a single charge with its 8.5" wheels each with a 400 watt motor that can climb an 18 percent degree hill without even hesitating. The raw power gives it superior balance capabilities and the sturdy well-designed case can be tossed around without a scratch. Package contain: Charger, User manual, Package box, Carrier bag INCLUDED. 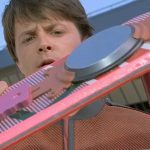 We’ve tested it for about 40 miles and we have yet to find any Cons for this hoverboard. But we’ll keep on searching! We tested the Epikgo hoverboard today, they gave us a little tour on it through the phone and then we were on our way. Since it’s said to be able to take any terrain we felt the need to put it to the test straight away and headed to the beach and there is one thing we can tell you about riding a hoverboard on the beach. Be aware of the waves! We just had to ride it on the beachfront and it got a little wet but it pulled through without a single problem. You can feel how stable this new hoverboard is and the design of both the hoverboard and the wheels are nothing less than brilliant. Far superior to most of its competition and we have tested and reviewed over 60 “different” hoverboards by now. After a good 20 minutes riding it on the beach it was time to go off-road, we rode it through mud, on grass, literally anywhere we could think of that might get it into trouble and it just pulled through every time. Well, we didn’t ride it on big rocks, but that felt pointless. So EpikGo released a new version of their popular off-road version called EpikGo Sports edition. We finally had some time to test it out and here’s our verdict after comparing them. There is nothing new to the EpikGo racing model except the high-tread tires which were created for enhanced grip and lower resistance when riding. This increases the hoverboards maximum distance by about a mile or two at best and we actually hit a higher top speed with this model, almost 13 mph. But what makes a huge difference is street riding. Riding is much smoother and you get much better grip while riding on dry pavements. The sports model still do take on rougher terrain like dirt, grass, and gravel. Although, I highly recommend the off-road version that is more versatile and since I personally love riding off-road with a few bumps and stones. You can check or read more about the sports edition of the EpikGo on Amazon here. How sturdy can it be? Well, not sturdier than the EpikGo I can tell you that straight away. You can feel the raw power of the 400-watt motors (x2 = 800 watt) which gives it about x2 times more power than most of the competitor’s hoverboards. Combined with the army grade battery which is built with the same technology as the batteries you find in electric cars. It has undergone 159 points of the UL 2272 test in order to ensure no fire or overheating might occur. Doing this they didn’t even have to bother using the easily cracking fireproof plastic. It has solid 8.5” rubber tires with fantastic grip and the big wheels combined with the grip lets you climb over obstacles with ease. 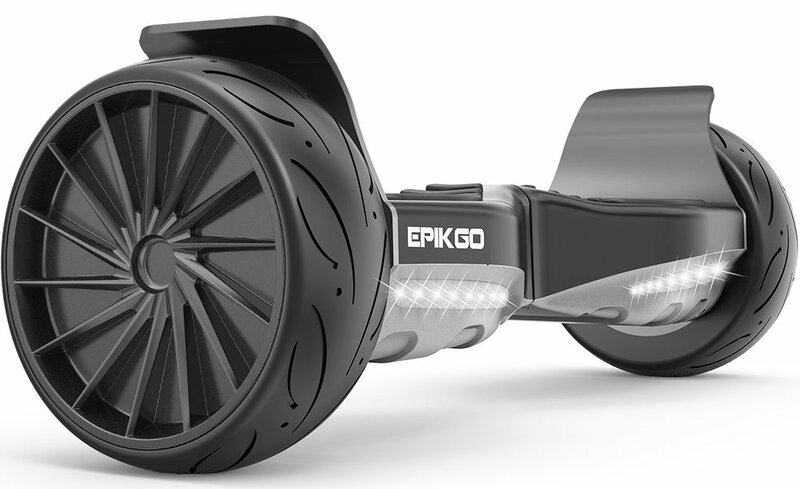 The climbing ability of the EpikGo hoverboard is 18 degrees but with a bit of speed you could easily go up low curbs. Something that has been almost impossible on the smaller self-balancing scooters. It’s riding abilities reminds me of when we first reviewed the Segway MiniPro which felt groundbreaking in terms of keeping its balance. Combine the above things with its new hard ABS casing which is built to resist most crashes. The wheel covers made of steel makes for excellent protection against damage to the interior and isn’t easily broken, an issue that has been frequent with the normal plastic hoverboards. The new bright and strong Led gives excellent light while riding at night and it has 2 red lights at the back which makes you more visible to others. A one of a kind ride which gives me the chills just writing about it. We had a fantastic time testing the EpikGo hoverboard out and it delivers on every terrain that we put in front of it. You can feel the quality of the board just by standing still on it. If we were to say two words about it that would be: Sturdy and Safe. With its 12 miles per hour top speed (clocked by us at 12.1 mph with App) and a distance of 12 miles, you can’t really ask for more. The increased power makes it much easier to balance and even though you tilt forward at top speed it is able to push you backward in order not to over-speed which often results in a crash. If you’re like us and want the newest and best thing available then you shouldn’t hesitate, give the EpikGo a GO! -What are you waiting for? 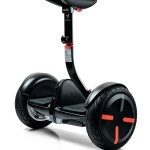 Segway MiniPro Review - How good is the Ninebot Segway hoverboard? Segway MiniPro Review – How good is the Ninebot Segway hoverboard? © 2017 Hands-free-segway.reviews. All rights reserved.